Anyone who follows the scoot chicks knows we love to run — and we love to look and feel good when we run. Last year, I came across a coupon code for PRO Compression socks and decided to give them a whirl. It was love at first wear. Now I use them regularly – for long runs, to recover after long runs even when at the office, a party or doing yardwork. PRO Compression is a California-based company makes socks for endurance athletes, to be used before, during or after exercise such as running or golf. The idea is for enhanced blood flow in your lower extremities. And THAT feels fantastic! The company offers four running styles – Marathon (my fave), PC Racer, PR Runner and Trainer Low – in a variety of colors. For folks who prefer calf sleeves or love arm sleeves, PRO Compression has those too! And – this is a big things for me – the socks are made in the USA! Thanks to a partnership with Fit Approach, I had the chance to test run and review a pair of marathon socks. I already knew I loved them – hi, I have six pairs and wear them regularly. But I jumped at the chance to test run a brand new pair and share my thoughts with you all. 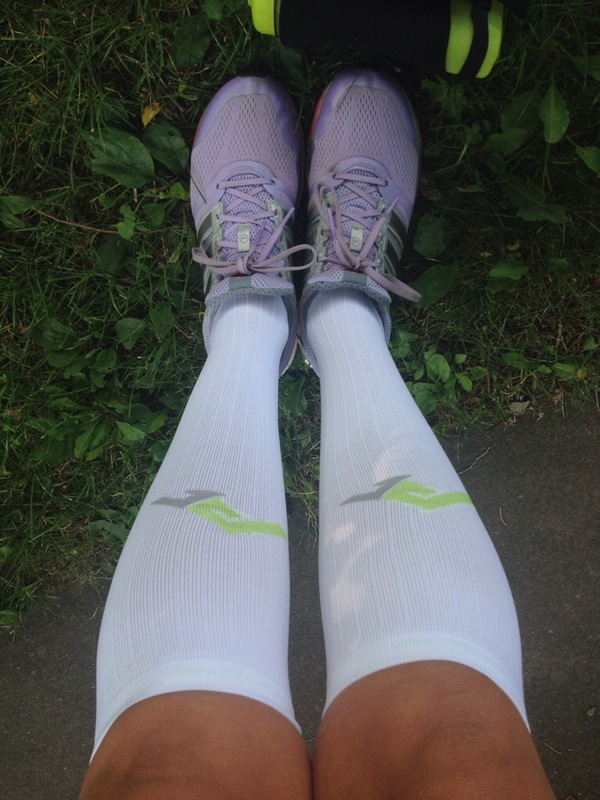 Meet my newest pair of PRO Compression socks – and they are white! I’ve worn this pair a few times now – mostly on long runs as I’m ramping up my training for my fall marathon. Like my other pairs, they look and feel great. While running, my legs don’t feel strained when I wear them, which makes for a far more comfortable long distance run. And look! My legs weren’t tired at the end of this hill 8-miler last week, in part because of the socks. So I sped up at the end of the run. Success! I also wear the socks for recovery, which means I lounge around the house – or spa (riiiiight) with them on. I’ve worn them to work under my pants and to the store, with shorts, because I totally rock that look. These compression socks promote circulation in your legs by pushing fluid up from your feet toward your knees. In other words, the sock helps reduce swelling and inflammation while also providing support to muscles and tendons. Other features I love about these socks – there’s arch support with compression, a wide cuff at the top to make sure my calf fits in, they’re moisture-wicking (so, so important) and I’ve never had blisters from wearing them. If you’ve not checked out PRO Compression socks or sleeves I have a discount code for you – “PINK” Will save your 40% on your entire purchase. That’s a sweet deal! Have your tried compression socks or sleeves? What do you think of them? What’s your go-to brand? I was provided one free pair of marathon socks by PRO Compression so I could use and review them. My opinions and words are entirely my own. I’m all over fruit juices from upstate New York farms. Flavored apple juice from Red Jacket Orchards in Geneva, Ontario County – I buy it every time I see it. Freshly-squeezed Wegmans orange juice? Can’t get enough of it. So when Cheribundi approached me about trying a sample of the tart cherry juice, I was all over it. I love cherries, therefore I would love cherry juice, I thought. And I was right. The juice is tart but refreshing, and the Geneva, New York-based growers boast there are 50 freshly-picked cherries in each bottle. Lately, I’ve been hearing all about “superfoods,” which are foods supposedly beneficial to your health – like kale, broccoli, berries and lentils. Cherries, of course, are among them. Cheribundi calls their cherries a “superfruit” since each is packed with phytonutrients, melatonin and vitamins including vitamin A, potassium, iron and calcium. The original tart cherry juice (my favorite) is 90% pressed tart cherries and 10% apple juice, which sweetens the drink instead of sugar. Yep, that’s no added water or sugar. Cheribundi teamed with food scientists at Cornell University (ahh, Ithaca, my old home) and researched the benefits of tart cherries, and also created a gentle juicing process to maintain cherries’ levels of melatonin, vitamins, nutrients and other antioxidants. Rather than take part in Cheribundi’s 7-day challenge, I decided to test the juice each time I returned from what I deemed my worst recent runs, hoping the juice would work its magic powers. Presto. Each time I felt better. (Not to mention, my hubby was entertained as I repeatedly tried to squeeze every last drop from the bottle). And there are several types of juices, teas and even smoothies. Personally, I love the benefits, but I drink it because its natural, local and darn tasty. A win-win-win! Plus, I love that the Cherry People are headed up by a man named Pear. (Steve Pear, CEO). Little things just make me smile. Have you ever had cherry juice? Do you love all things tart and tasty? Have you been to the Finger Lakes, were farmers grow the cherries that becomes Cheribundi juice? Cheribundi provided the cherry juice for me to taste and review. Opinions and (attempts at) wit are entirely my own. A few weeks back, the fine folks of Kindrunner sent the chicks our long-awaited ambassador shirts. I’ve packed them up to bring them along to my girls this weekend in Florida! As you may recall, the Scoot chicks announced earlier this year that we teamed up with New Jersey-based Kindrunner to spread the word about their online business. I personally love their mission. I love that they aim to bring your used sneakers to those who need it most. AND they’re keeping countless pairs of used shoes from heading to the landfill. I am all about re-purposing and recycling, as are the chicks, so it was a perfect fit! But there was an extra prize in the package – a super sweet pair of Brooks running socks! What’s that? Kindrunner sells more than sneakers? Why YES! They sell all sorts of running accessories – handheld water bottles and hydration belts, fuel, watches, of course, running socks and sleeves and much more. A few days after the package arrived, I popped the new socks on to test them out. Success! You know when a pair of socks work for you and you know when they don’t. I walk – a lot, and I run even more. So yes, Solid running socks and shoes are vital tools of the trade. I’ll be honest, I am not a Brooks fan and I’m pretty loyal to my current running sock choice….but I do like these socks. They fit comfortably, didn’t shift as I ran and allowed my feet to breathe as they warmed up. Two thumbs up! What sort of running socks are you partial to? Do you ever give other brands and styles a whirl? Tell us in the comments!